Monarc circular tall vase is one of the best choices for your living room. It is very well-designed and looks beautiful and standard. 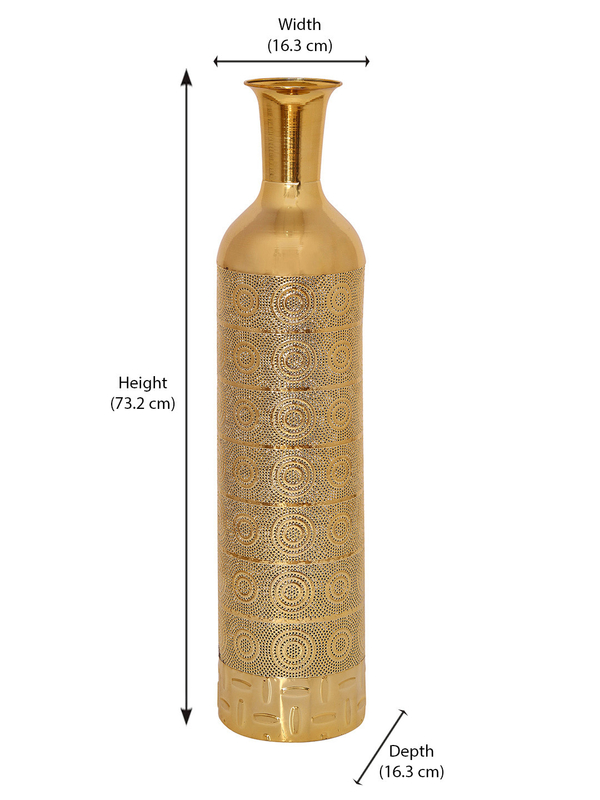 The height of the vase is 732 mm and the width 163mm. This beautiful vase fits anywhere and makes even a plain corner look beautiful and amazing. The vase is made up of good quality metal making it reliable and durable. The gold color of the vase perfectly blends with any kind of decor and intensifies the appeal of the room. Vases are one such item that makes your room look good as well as adds a cheerful vibe to it. These vases can also be used in offices and cabins to make them look appealing and adding a good vibe to the work atmosphere. Buy this vase from @home at affordable prices. @home is an online store for furniture and other home utility products. All the products on the online store are reliable and durable as they are pre-checked. They also provide facility like customer care staff which is always available to answer your queries. The deliveries are right on time and the services provided are great. Don't wait any longer, order this beautiful vase now.